Golden Age ABR-1 Tune-o-matic Bridge, Nickel by Golden Age at Tritone Guitars. MPN: AN4566-N. Hurry! Limited time offer. Offer valid only while supplies last. A 1960s style Tune-o-matic bridge for the vintage look, with adjustable intonation screws held by a retainer wire.The metal saddles are slotted. View More In Bridges & Bridge Parts. A 1960s style Tune-o-matic bridge for the vintage look, with adjustable intonation screws held by a retainer wire. The metal saddles are slotted. Knurled height adjustment thumbwheels and threaded mounting posts (2 each) are included. String spread is the distance between the centers of the outer strings on a bridge or tailpiece. Saddle radius determines the arc formed by all the individual saddle heights, and is similar to the measurement of a fretboard. 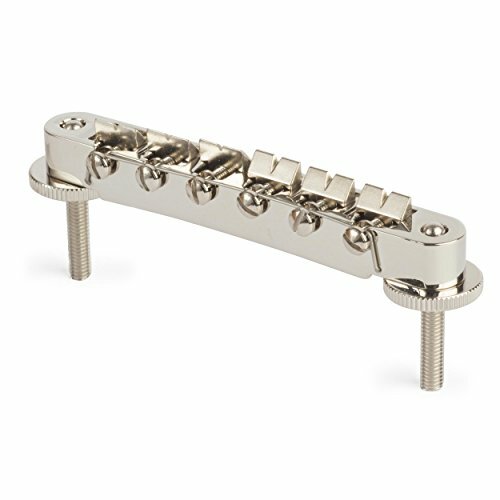 Stud/post spacing is the distance between the centers of the mounting posts of a bridge or 'stop' tailpiece. If you have any questions about this product by Golden Age, contact us by completing and submitting the form below. If you are looking for a specif part number, please include it with your message.